This time of year is exciting for a few reasons. Facebook is the biggest and Pinterest passed Twitter. One reason I guess would be the fact that it’s a New Year and that means new opportunity. The great thing about life is that there is always new opportunity. Every moment offers an opportunity to change, but since people struggle with change we don’t always take it; myself included. But events like New Years help us make the leaps of faith when it comes to taking on new things. Anyway, it’s a New Year and another reason it’s an exciting time is we get new research coming out. For marketers it’s a like a second Christmas morning. There is new data and findings to read through and for us bloggers it’s more information to share with readers. 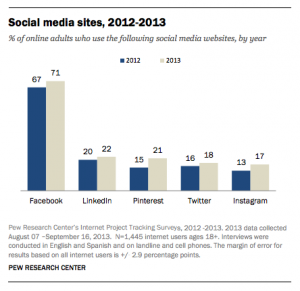 One of the reports that came out recently was a social media report from Pew Research. Pew is one of the best out there when it comes to all types of information and research. I look to their reports often when trying to help improve our marketing at GBW and when blogging for this blog. The full report is worth your time. It’s quite extensive, but take a half hour and read through it. And save it for later reference because there are always questions about social media during the year. For this blog post, though, I’m going to pull out a few interesting tidbits and provide some action steps. Facebook continues to hold the lead in the social media world. Nearly everyone is using the social media site it seems. The next closest on the list is LinkedIn at 22% with others close behind. That’s a pretty big difference and for marketers it might seem like the obvious bet for using social media is to use Facebook. While that is true in most cases it doesn’t mean you have to be on Facebook (GBW isn’t) and it doesn’t mean that your target customer is using Facebook or looking to find businesses on Facebook. We’ve experimented with Facebook before. It’s hit and miss. We don’t manage a Facebook page for GBW and I don’t do it for my personal site, Country Music Life, either. It seems like a lot of people get in trouble when they commit too much time, effort and even content to Facebook. We’ve seen many times and even recently that Facebook will change the rules for brands. Action Step: Identify your target customer. Determine if they use Facebook. If yes, determine if your brand is the type that people want to interact with on Facebook. Games seems like a good bet compared to something like website development, but you never know. Start a Facebook page if you see value to be had, but use The Snippet Strategy to build your following. Both Pinterest and Instagram made big moves this year in social media. They’re not on the same level as Facebook, but they made big jumps. Pinterest even moved past Twitter in popularity and Instagram is right behind. Visual items like photos have always been a part of the social world. I think at one time Facebook was the largest photo sharing site in the world and it might be still today. Instagram and Pinterest and two more examples of how visual people are. Action Step: When posting on social media sites use visuals. Take your own photos. Hire a professional photographer for a few things, but also take some within your company. Your staff may already use Instagram. Start a blog and add images to it. It’s easy to do and it makes the posts more likely to be shared on sites like Pinterest. It would take time, but you could also start your own photo communities on Instagram. Golf Digest has one that I like. This compares to only 8% of online adult men that use the online sharing and bookmarking website. When I talk about knowing your target customer and knowing your social networking site I’m talking about this. Some people prefer different social networks. Yes, most people use Facebook, but discriminate when you use social media. Look at all the things that make people different. That’s what we do as marketers and it’s the only way you can get the most out of social media. Action Step: Reassess your target customer. Run a survey of your current clients asking them what social sites they use the most and why. You can gain a lot of insight about where you should be investing your social budget. I found this one interesting and I completely believe it because I’ve seen it. One of my goals this year was to make more connections on LinkedIn. The reason was that I was having good success with connecting with people on LinkedIn and having them turn into GBW clients. It’s also a good source of traffic to the GBW Blog via the posts we share. Some readers frequently share our posts there as well. As I’ve connected with people on LinkedIn I’ve noticed that it can often take more than a single day for them to accept. Even with people getting emails about the invite they still can take a few days. LinkedIn seems to be trying to change this with an updated Newsfeed, but right now people just don’t use LinkedIn that much. Actually, I think the 13% is interesting because the people that do use the site every day are really passionate. They’re in the groups and discussions really adding some good content. This stat also proves that people don’t have to use a social site every day for it to be effective for businesses. LinkedIn has been the best social media site for GBW in terms of sales (Twitter is for traffic). Action Step: If your customer is a professional then look into LinkedIn this year. Ignore stats like this because if you use The Snippet Strategy and share content and make connections on LinkedIn it can really pay off. Hopefully these little tidbits from the report and action steps can be of some help for you in the New Year. It’s always time consuming to read through these reports and even if you do find time to do that it’s difficult to know what to do. So with this post we tried to provide some action steps that you can take this year to improve your brand. In reality, these action steps are things we’ve been suggestion at GBW for years. We also follow them ourselves and have had success. Sometimes it’s not always something new that has to happen, but a tried and tested method that will help you grow.